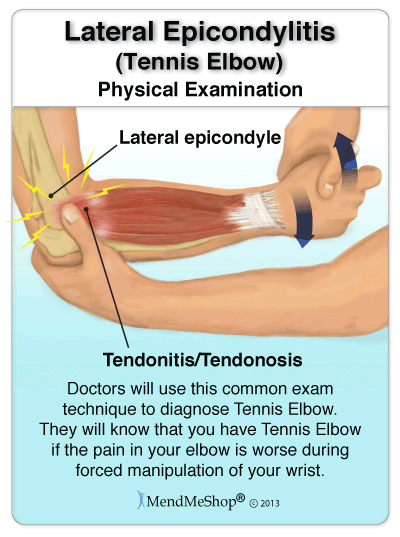 Common Symptoms of Tennis Elbow. The onset of tennis elbow pain is normally gradual with tenderness or a dull ache felt in the tendons of your forearm muscles on or below the bony bumps of your elbow. Pain can also be experienced when your wrist or hand are straightened, when your palms are facing the ceiling, when you flex your wrist and fingers backwards while straightening your elbow, or when you rest your wrists on a tabletop or desk. 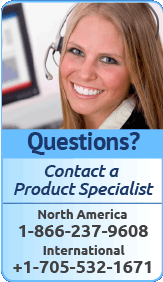 Are you noticing pain, discomfort, immobility or restricted motion in your elbow or forearm? Do these symptoms appear before, during, or after you exercise, do daily household duties, or at work? These symptoms could be the first sign that you are suffering from Tennis Elbow. You may notice swelling, heat or redness, inability to lift or carry objects, inflexibility, deformation, bruising, or pain caused by movement or that persists even through rest. If you have tennis elbow, you will feel pain or discomfort when performing repetitive movements such as grasping, carrying objects (a tray, a baby or books), or twisting with your hands or wrists. If you do not seek treatment in the form of warming and cooling temperature therapies for your symptoms and you are suffering from Tennis Elbow, you may develop a chronic Tennis Elbow injury due to overuse or even re-injury. 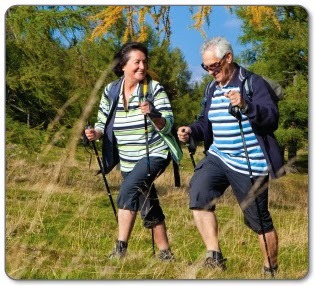 Chronic symptoms can include pain before, after, and during activities that does not go away as well as limited range of motion and inflexibility that will interrupt your daily life. Straightening your wrist or hand, or turning your palms to face the ceiling may cause severe discomfort. Extending and flexing your fingers or lifting everyday objects can trigger Tennis Elbow pain. These symptoms may require you to change, or completely stop, movements using your arm or hand. In severe cases, turning a screwdriver or even holding a coffee cup can cause intense discomfort. It is easy to forget how much you use your hands and arms on a daily basis. When you are suffering from Tennis Elbow, even the most simple tasks can become quite a challenge! Imagine having to take weeks or even months off work, or missing a whole season of your favorite sport or activity. The burden that an untreated Tennis Elbow injury can place on your finances, your family, and your quality of life, can be heavy. Tennis Elbow pain normally starts with tenderness or a dull ache around the bony bumps on the outside of your elbow. These bumps are also known as your lateral epicondyle bone. 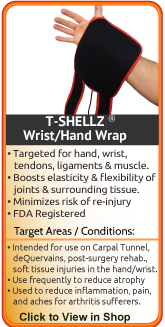 It is here, that the tendon for the muscle in your forearm, attaches to the bone. If left untreated, the pain may gradually start to radiate, from the outside of your elbow, extending down into your forearm and wrist. Typically tennis elbow starts off as acute, or short lived pain that goes away after about 24 hrs. Symptoms of Tennis Elbow are not the same for everyone. You may experience only one symptom or perhaps a combination of symptoms. The severity of these symptoms can differ from person to person. Sometimes, a person suffering from Bi-lateral Tennis Elbow (that's both elbows at once ) will have different symptoms for each elbow. This is because no two injuries are exactly the same. By hiding your Tennis Elbow symptoms you are putting yourself at risk for damaging your elbow permanently. While some symptoms can occur suddenly (as with an accident or acute trauma), Tennis Elbow is most often a case of gradual overuse. If not given proper attention, repetitive stress and re-injury will develop into a Chronic Tennis Elbow Injury. 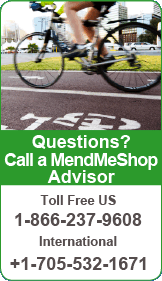 It is important to remember that pain is not the only indication of a serious injury. The micro tears, scarring, and inflammation which are the underlying causes of Tennis Elbow can occur even if pain is not noticeable or is relieved quickly. 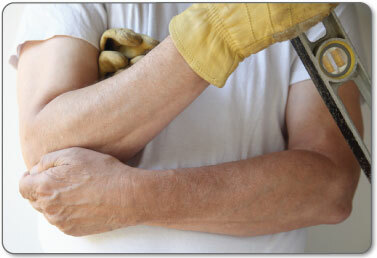 Repetitive Stress Injuries (RSI) are most often caused by this common misunderstanding. 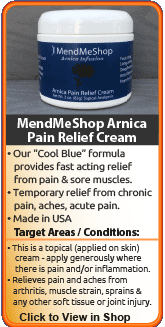 Being proactive is the best way to fight Tennis Elbow. 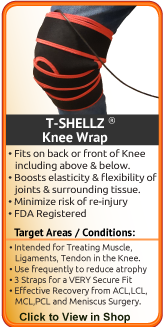 Stop the pain and damage before it causes further injury requiring months, or even years of your life spent in recovery. 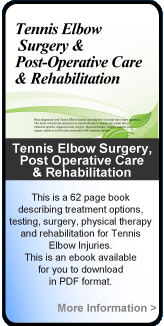 The information you will discover here will help you manage your Tennis Elbow symptoms as soon as possible. 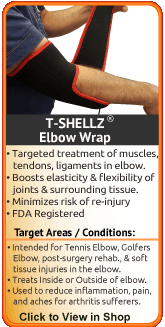 We have tools that will help you with tennis elbow pain and healing. When it comes to your injured elbow, it's best to start effective long term healing right away. 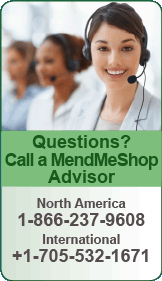 Our Advisers are highly trained individuals and will help find the long term healing goal that's right for YOU. Why wait? You should always consult your doctor when you begin to experience recurring pain or symptoms of Tennis Elbow injury. It is essential to speak with a medical professional if you have started, regularly taking, "over the counter" medications to treat your symptoms. A proper diagnosis from your physician is the only way to know for sure that you are suffering from Tennis Elbow. A visit to your doctor can rule out any other conditions that may be causing your symptoms such as, injury to the shoulder, arthritis, or bursitis. Before and after tennis elbow surgery, during rehabilitation, to warm up your elbow before physical therapy exercising or stretching.